There is no lack of advertisements for devices, games and tasks that are meant to train our thinking and memory, just as exercise trains muscle. And, wouldn’t it be great if we could increase our brain power like Lucy in Luc Besson’s movie? Whilst the claim that we ‘underuse’ our brains is controversial, scientists are developing techniques which allow us to regulate our own brain activity and improve our performance. Neurofeedback has been around for a while and has developed in ways that fill us with enthusiasm and hope. It involves a brain-machine interface which measures brain activity and provides the participant with real-time feedback. The feedback might take the form of coloured shapes shown on the screen, with colours ranging from blue (low activity) to red (high activity). Depending on the task, participants are instructed to change the colour of the square using only their mind. For example, if the aim of the training is to increase activity in a part of the brain, participants need to try to change the colour of the square to red. If the aim is to decrease activity, they should aim try to turn it blue. Often it is up to the participants how they achieve the change in colour – as long as it works, it doesn’t matter! This fun-sounding method of training our brain can improve our ability to think, often impaired in depression. Such difficulties include problems with working memory, i.e. holding and manipulating several pieces of information at the same time. In a study which used EEG to measure electrical activity of the brain, after eight training sessions patients with depression were better at the tasks that required working memory than patients who were not trained. They were also able to think faster. Another target for neurofeedback training is the ability to regulate our feelings. A small part deep in the brain, called the amygdala, plays a major role in emotions. In people with depression and anxiety, the amygdala is hyperactive and its responses to sad objects or events can be exaggerated. This activity can normalize after therapy, however the treatment sometimes takes a long time. 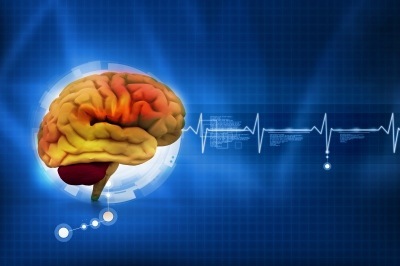 Is it possible to speed up the process with the use of neurofeedback training? Researchers scanned the brains of healthy participants (using fMRI) whilst presenting them faces with negative emotional expressions. Such images usually increase activity in the amygdala. Here too, participants saw the activity in the emotional center of their brain as colours. In this case, however, they used more specific strategies to reduce the activity in their right amygdala, which included thinking: ‘these are pictures, this is a study, these are actors’, or by distracting themselves. After 4 training sessions they were much better at down-regulating the activity in their brains than the participants who just looked at the faces without the instructions. 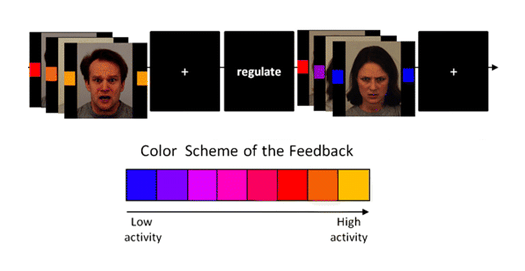 The task and the colour scheme of the feedback on the activity in the amygdala. Down-Regulation of Amygdala Activity During Emotional Stimulation: A Proof-of-Concept Study. Brain Topography 27:138–148. It’s good share on fear i am so pleased to read it. This just shows once more that there are virtually no limits to what we can do with our mind, even though this increased brain capacity idea à la Lucy maybe isn’t the right approach. This concept of being able to actually train our brain and be able to control how we feel is just so empowering. Seeing the manipulations already achieved in nature by scientists makes this neurofeedback training a possible reality in the future. One thing we must all keep in mind about this whole concept is where is the line between human developments and influence in nature drawn? Interestingly anecdotal research has also shown that neurofeedback may be a potentially useful intervention for a wide variety of brain-related conditions. It has been used for autism, depression, headaches,pain, aggression, stroke and trauma. If we are able to utilize it correctly and efficiently the possibilities would be endless. But also, the possibilities extend past just the realms of human health. They extend into the arts A study involving musicians and alpha-theta training showed an improvement in the three music domains of musicality, communication, and technique.Alpha-theta training has also shown to improve novice singing in children and enhanced performance in dancing.Furthermore, neurofeedback has also been shown to introduce a superior flow state in actors, which may be due to greater involvement while performing. the morning as a result of people reading and commenting on a blog. So now it comes full circle returning to the consumer who’s taken on the role in the blogging site administrator.